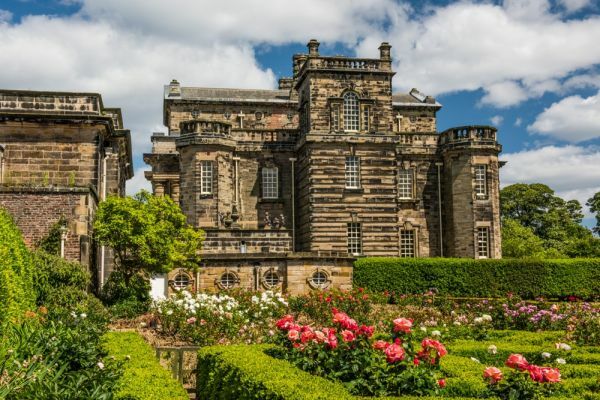 Seaton Delaval Hall is a glorious Baroque mansion built by Sir John Vanbrugh for Admiral George Delaval between 1718 and 1728. 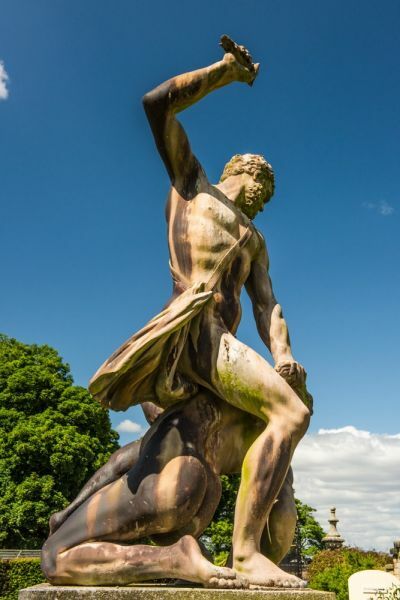 This is perhaps the best of Vanbrugh's work, which also included Blenheim Palace and Castle Howard. The house sits in extensive gardens designed in 1947 by James Russell. In the grounds are numerous garden features, including a fountain, pools, and topiary. Also within the grounds is the Norman church of Our Lady. The church began as the family chapel of the Delaval family, whose funeral hatchments adorn the walls. There were Delavals at Seaton since the 11th century, and one of the Delavals was involved in forcing King John to sign the Magna Carta in 1215. When Admiral Delaval purchased the estate there was a sizable house there already, but the Admiral's ambitions ran to grander things. He commissioned Vanbrugh to build a new house, and the old mansion, with the exception of the church, was pulled down. The design is simple in essence, with a central block flanked by matching wings. 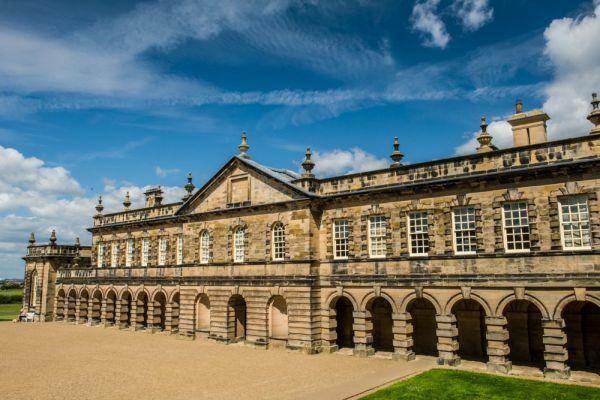 The east wing housed the ornate stables, while servants quarters occupied the west wing. The centre block contains the state rooms and principle chambers. During the Georgian period, the Delavals lived in a social whirl, hosting large parties and engaging in theatrical productions. A disastrous fire in 1822 gutted the centre block, and the state rooms were never fully restored. By 2009 the central block of the Hall was in danger of collapse and the entire site was ready to e sold off. 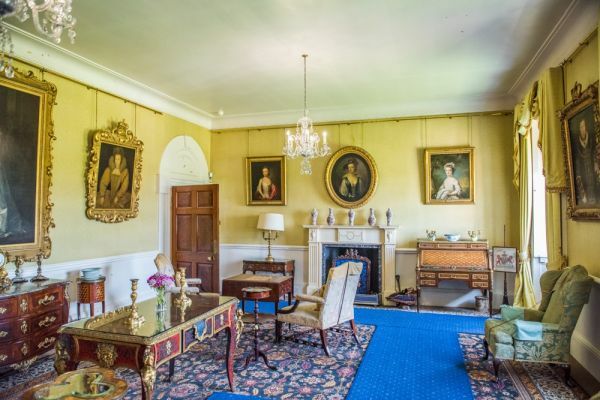 An appeal for funds was launched and the National Trust was able to purchase the estate. 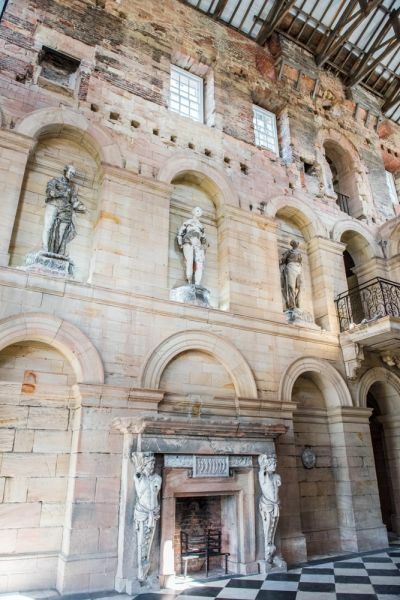 The Hall was stabilised, though the central block was left as a shell, showing its state after the 19th-century fire. But what a shell! 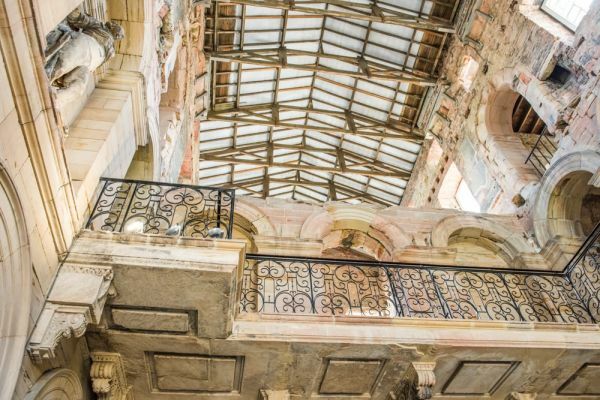 Stand in the great entrance hall and look up to the soaring roof high above. This was a house built to impress and it still does that today. At both ends of the central block are beautiful spiral stairs where you can look through the centre of the stairwell all the way up from the cellars to the top floor of the house. If the central block of the Hall is a glorious empty shell, the west wing is a sumptuous delight. Here you see staterooms restored to their full grandeur, and filled with mementoes of the Delaval family and their lives. 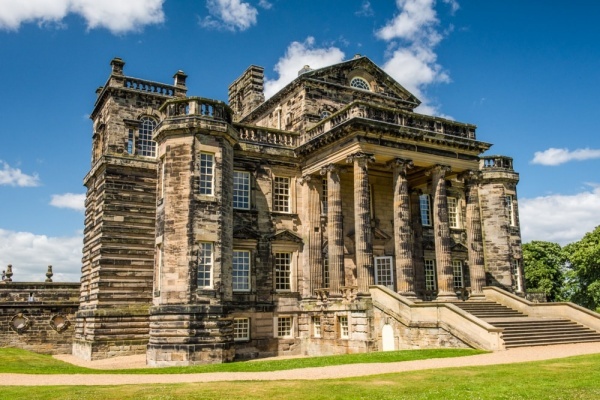 In a special exhibition room are objects collected by the Astley family, owners of Seaton Delaval from 1814 until 2009. The most fascinating object on display is The Fairfax Jewel, purchased by Jacob Astley, 16th Baron Hastings from the Horace Walpole collection at Strawberry Hill. The ornate Jewel was given by Parliament to Thomas Fairfax after his victory over Royalist forces at the Battle of Naseby in 1645. In a curious twist, Astley's ancestors fought in that same battle ... for the losing Royalist side. The Jewel consists of two enamelled roundels, one showing Fairfax on horseback with a backdrop of the battlefield, and the other shows the House of Commons in session. 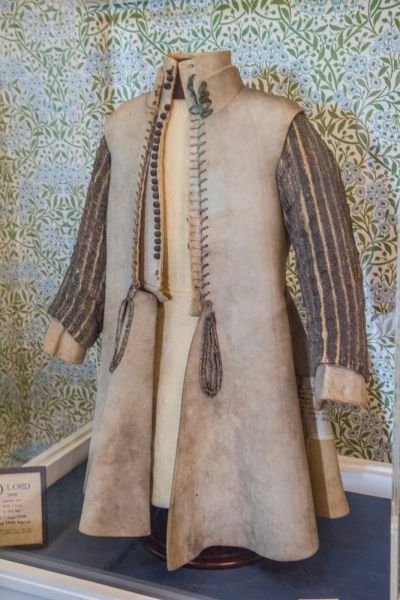 Another object on display is a purse used by Cardinal Thomas Wolsey and a pair of gloves given by Elizabeth I to John Astley. Beside the gloves is a mitten that once belonged to Princess Charlotte, the only child of the Prince Regent and Caroline of Brunswick. 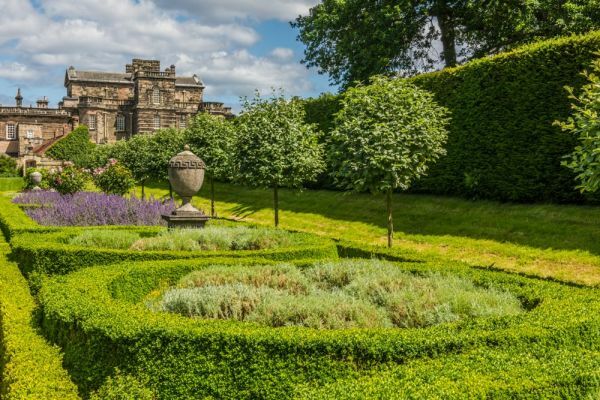 Seaton Delaval Hall is an absolute delight to visit; the gardens are superb, Vanbrugh's architecture is stunning, the shell of the central block is awe-inspiring, and the staterooms are full of interest.